"Met Henry Cavill-The Superman Hero. This Super lad is Super down to earth." Here we were just saying, how there had been no new pics of Henry in a while.. and then we got some! Thanks Cali for the heads up. Krish and his friends met Henry in London today, and we even got a peek at Super puppy.. hi Kal! When we spoke with Henry a few weeks ago, he mentioned he had just started the leaning phase of his Superman training. And you can already see the transformation. We can't tell you how excited we are to find out how he'll look for Justice League. Stay tuned. 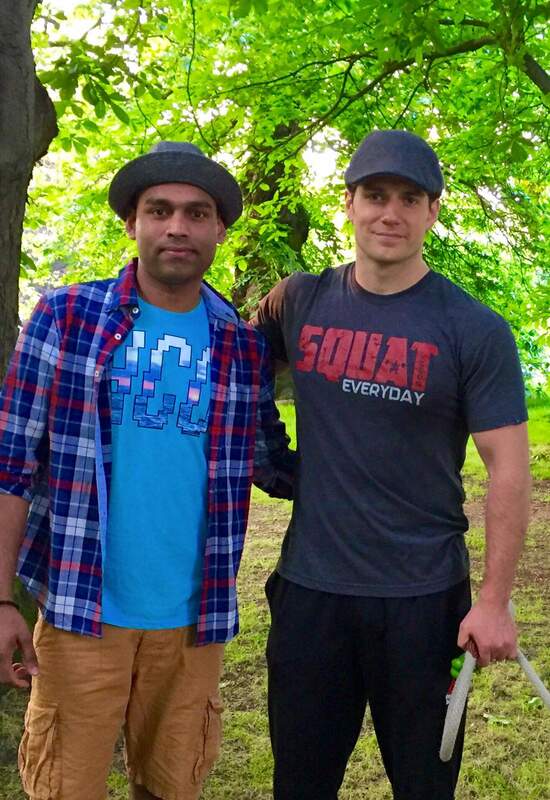 UPDATE 6/11: Krish has shared the full photo from the day he met Henry, and Kal is now in there! (plus he said some really nice things about Henry). Superman walking Krypto and taking the time to take a pic! Sweet! Great to hear about his leaning phase in his Superman training, too! I can't wait to see how ripped he is this time (seriously, he really makes me want to get into better shape and impress this girl I work with)! Even moreso, can't wait to hear the status of his filming in Justice League! Deo! people have questions for you below. You're in demand. It's amazing how fast he's able to "lean" down. I wish I could do it that fast! :) He looks great. Totally clean shaven too. I wonder if he was on set very recently? Love Henry's hat and, of course, Kal. Yes and no. From what I've learnt first hand, when building muscle mass (as Henry is for Supes), first you have to bulk. Bulk means to gain weight, build muscle, increase strength. Healthily and slowly of course without overdoing it, whilst eating a certain amount that the caloric surplus is used as energy when exercising without storing itself into fat. You shouldn't really just be stuffing your face with everything and anything whilst bulking. Remember, muscle gain not fat gain. You need to be exercising daily to activate muscles and increase strength. The goal for bulking is muscle weight gain NOT fat weight gain. My questions is to anyone but I think Deo might know the answer. How will Clark Kent return? Yes I like Supes a lot but I loveeeeeeeeee Clark he's adorable. Is the DCEU not going to have him as a reporter anymore or will he just be Superman from now on? YES great question! I hope CK comes back & it's not just Superman not that I don't like him. Like AnonymousJune 7, 2016 at 4:06 AM said Clark is adorable. I hope WB/DC & Zack Snyder gives Lois & his fans our sweet Clark Joseph Kent back. Clark Kent (not Superman) coming back isn't really as impossible or unlikely as many might think. Remember, Clark left the Daily Planet sometime after seeing pictures of Batman's victims and Perry was depicted as yelling for him and later on asking Lois where he is. While this was going on, Superman had his own problems and was still around. Not to mention, the newspaper stated that Clark was killed reporting on the trinity's fight with Doomsday. Thing is, no one saw his body and beforehand, like I said, no one even knew where he was for a time. That's a window of opportunity for him to say he was following a lead, ended up in an accident, and was MIA from that point up until Justice League. And while many residents of Smallville saw his body in the open casket, I'm pretty sure most of them knew Clark was Superman; as many knew about his powers when he was growing up and likely recognized him as a man (like Pete did in MOS). They could easily just vouch for him and say that his casket was actually empty instead of Superman's (no one in Metropolis saw Superman's body either); why wouldn't they? They clearly had respect for him to the point of attending his funeral and clearly recognized him as a hero. It's not too difficult bring him back when you really think about it. Of course, I'm basing this on what I saw in the theatrical version. For this upcoming ultimate cut, there are clearly more scenes of Clark Kent, so that may complicate my theories until I see what the scenes entail. Great question, btw! Hope I was able to help! WOW I think you should be our DC and anything comic related columnist Deo see I was thinking nobody saw CK and well Batman and WW must have been the ones to transport his body back home to smallville. There were like 3-4 people in the room where Clark lay. Although we didn't see his face I think you might be right that most or a few from smallville must have known that CK and Supes are the same person. It should be interesting how they clear up everything from BVS and the DVD might explain more. Maybe Flash could help clear things up or maybe martian manhunter might make a cameo. It should be excited either way. This is Anonymous June 7, 2016 at 4:06 AM. Deo thank you so much! Yes you've helped a lot and it should be interesting how Clark returns. I agree with AnonymousJune 7, 2016 at 10:47 AM you should be our DC/Comic columnist :D Interesting theories! Shame that it looks like others know about Clark's identity but hey maybe they can help lie for him. Anonymous June 7, 2016 at 10:47 AM and Anonymous June 7, 2016 at 4:06 AM, thank you both! You flatter me. I've been a comics fan since the age of 11 and this DCEU is like a dream come true for me. And notice them or not, you both had some good ideas as well. Martian Manhunter appearing would be a great idea. In the comics, prior to the New 52 I believe, MM has known about Superman since he was a kid and even at one point disguised himself as one of his teachers. The case may not be the same for the movies since it was made clear in MOS that they had no way of knowing he'd make it to Earth, but with MM in the picture, he could shapeshift into Clark and give a great explanation for his whereabouts and circumstances while Superman is out doing his thing, thus allowing the character to return. Many will call that a copout, but I would consider that a stroke of genius, as it further proves the notion that there is a much bigger world out there than people think in addition to the fact that it further shows that Superman has a powerful legacy; having comrades not just willing to fight alongside him and follow his lead, but to also even help him with his personal issues. As for others lying for him, naturally Lois, Lana, Pete, and Father Leone would do it in addition to anyone else who saw his face, went to his funeral, and considered him a hero. But let's not forget that Superman now has a trusted ally and potential friend in Batman AKA billionaire genius Bruce Wayne. Emphasis on BILLIONAIRE GENIUS. Bruce could use his cash to pay off an impersonator to imitate Clark and not ask questions and using both cash and his unique mind, create/falsify scenarios that might have happened to Clark to explain his extensive absence up until JLPO. Some might still consider that a copout, but even in the grounded, serious DCEU, suspension of disbelief is a necessity. Especially since JLPO is said to carry a lighter tone than its extremely serious predecessor. One thing’s for sure, Henry will rock the screen next year and hopefully even win this year’s teen choice awards! OMG Deo I'm in love with you... :D the whole Martian Manhunter shapeshifting into Clark would be AWESOME!!!!!!!!!!!!!!!!!!!!!!!!! I'm so pumped for JL you just don't know. I too grew up watching the last Christopher Reeve, Lois and Clark the TV show, JL the animated cartoon, Superman the animated cartoon, Smallville, All DC related shows. MOS I was in shock at how amazing that film was. BVS was great too of course when Supes died i felt it! many didn't but if you love superman like we do trust me you will shed a tear or two. I think Zack should take note from yourself this is what I would love to see in JL and future possible supe films *Still hopeful* Wow!!!!!!!!!!!!!!!!!!!!!!!! Krish posted the full picture with Henry on his IG account. You can see Kal in this one. He said some really nice things about Henry. Thank you! - We'll update the post.